San Clemente bee removal demand is very high. Certainly, with the perfect mix of surf, sand, vegetation, and sunshine, San Clemente is a haven for bee activity. The Bee Man makes your safety a priority. Click here for our bee safety tips. If you have any San Clemente bee removal needs, please call us right away. San Clemente literally means “The Spanish Village by the Sea.” It has miles of hiking trails, many parks, golf courses and miles of beaches for people to enjoy. Furthermore, there are approximately 28 sunny days per year in San Clemente and the July high is around 79 degrees. As a result, bees, wasps, and yellow jackets appreciate the weather and like to build nests and hives in the area. The Bee Man is very active in the San Clemente area. As a result of prolific swarming, it is not uncommon for bees to get trapped indoors. Probably a scary sight at first, trapped bees are actually not very dangerous. 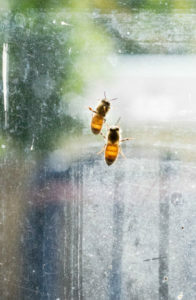 Because they are not near a hive, trapped bees are simply looking to escape from inside and return outdoors. The most common entry point for bees into homes include chimneys, vents, and canned lighting fixtures. Once inside, the trapped bee will always fly to a light source and try to exit. Unfortunately, the most common light source is a window with no outlet. So the trapped bee will buzz along the window pane looking to escape and eventually die due to exhaustion. Probably the best way to help a bee escape is to turn off all the lights in the room and open a door/window where light is shining through. The bee will naturally fly towards the light and leave. Do you need San Clemente bee removal? Call The Bee Man today at (949) 455-0123.